Soda Signs. I just about crashed my car when I saw this last night. I’ve been photographing out-of-the-way places for seven years now this month, but this is the first time I’ve seen such amazingly preserved signage. At first I thought this stuff might have been new/restored, but as a friend pointed out, this wasn’t really the neighborhood for that sort of thing. I’m not a big fan of Coca-Cola signage, as I’ve mentioned before, but this sign is in great shape. 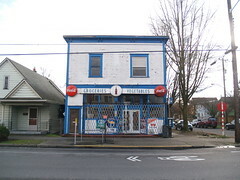 I’ve seen places that have curved bottlecap signs like this before, though they’ve always been under layers of paint. I’m glad to finally see them. The only type of Coke sign I know I’m missing now is the once-ubiquitous “fishtail”, seen in a Stephen Shore photo of Philadelphia, and on “Sal & Angie’s” in the movie French Connection. Electric Green. After photographing the store above, I turned right onto MLK Way (a day before the holiday, incidentally), and followed the street for awhile, looking at the progress of the light rail line (looks mostly done here). Near the Henderson Street station, I noticed a strip of green curling up into the hills. I could see an asphalt bike path weaving its way through the green, so I decided to pull over and go for a walk. 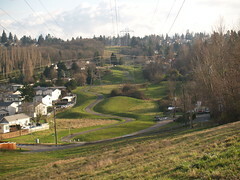 As it turns out, this is a strip of land underneath a Seattle City Light transmission line, called Chief Sealth Trail. I followed about 2.5 miles of the line, first southeast, where I stopped at the Creston-Nelson Substation (complete with an electrical plug safety sculpture). I then followed it back northwest, past MLK Way, up to near Holly Park, and back to my car (for what turns out to be about a 5-mile round trip). It was really a great sight in the setting sun, especially with Rainier set beautifully against the pylons. This entry was posted in Design, Urban Planning. Bookmark the permalink.